Update: The State of the State for Washington Latinos and students from Heritage University will be presenting stories about diversity as part of a mural unveiling ceremony on Thursday, May 3rd from 6-8pm. The event is open to the public; all are welcome to attend. Pedro de Valdivia (aka Mr. V) is here in Walla Walla painting the mural at Garrison this week as the capstone event in our Walla Walla School District 2011-2012 partnership. Our partners Diana and Bill Ericson of Walla Walla School District and Club Latino have worked countless hours with six Whitman students to explore efforts to improve cultural competency and programs for English Language Learners at Wa-Hi, Garrison and Blue Ridge. This effort has benefited from the support of leaders and teachers in those schools including Gina Yonts, Pete Peterson and Kim Doepker. Pedro’s work was recently featured in the Walla Walla Union Bulletin. State of the State first learned about Pedro’s exciting and inspiring art through our participation in the early convenings in Olympia of Hispanic-Latino Legislative Day (HLLD), where we shared our research findings and recommendations with state and local leaders in 2006-2009. In 2006, Pedro received special recognition from HLLD for his artistic talent and promise. Pedro has done an extended series of some fifteen paintings in collaboration with our community-based research project. Whitman is proud to own his 2008 work “¡Vamos a Votar!” which was featured on the cover of our Spring 2008 report on Latino Voting Rights and Political Participation, and which now hangs on display in Maxey Hall. Our partnership with Pedro has notably included a 2009 joint exhibition at Walla Walla Community College of all the paintings (then) in the series as well as a sound installation produced by Whitman student researchers. At the Community College’s annual Cinco de Mayo festival, we staged a “Public Art” presentation about connections between the dreams for a stronger, fairer and more inclusive community that animate both Pedro’s artistic images and our research reports. Our relationship with Pedro’s art is one of mutual inspiration and motivation. Our “State of the State” program strives to deepen and extend this artistic dimension because it helps us reach more people in more ways — especially on the levels of emotion and the senses — to provoke people to think about the aspirations, problems and potential solutions treated in our studies of education, immigration, political representation, poverty and other pressing issues. 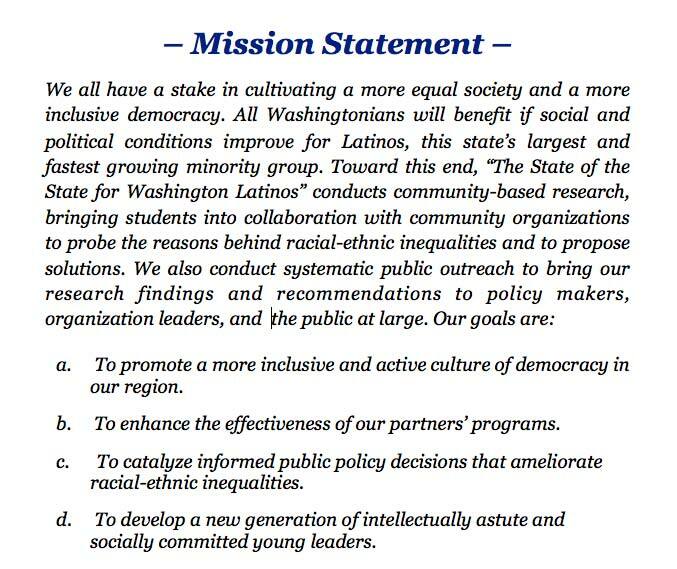 Pedro’s work, with its bold affirmation of new possibilities and the dawning of a better world for our community’s children and youth, also reinforces our program’s commitment not only to analyzing the forces that marginalize Latinos in Washington State but also to charting pathways to overcome them. Pedro stresses that through his art he wants to inspire the young to take ownership of their future and to invigorate their communities. Pedro has told me repeatedly that he hopes the new mural at Garrison, which the kids are helping to create, yields this kind of long-lasting impact, and my students and I emphatically share that hope. More immediately, we also hope the mural project will help spread word throughout the community about our new research findings and recommendations regarding ELL education and cultural competency in our local schools.